The conference registration table is always an adventure, always an open question. Will they have printed my last name correctly on my name bag? The name that I have personally typed into multiple online registration fields and attached to the paper submitted for presentation? In this particular case it is as Bourdieu said it would be. My last name rendered unintelligible to the dominant Western naming conventions. Symbolic violence. Not an intentional slight, probably not even a conscious action. A simple yet heavily laden assumption that it cannot be correct as written. Death by a thousand reasonable yet not rational cuts. If we imagine intersectionality as praxis, as something that can be done, enacted, the Sexualities, Race & Empire conference was intersectionality. Taken conceptually, as amplifying those marginalized within an already marginalized community, this conference set an incisive and critical standard for intersectional work. 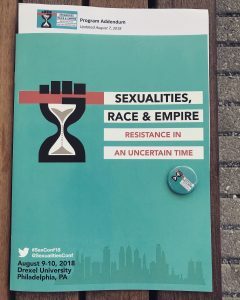 Part of its power was in its acceptance that those in attendance were both familiar with and invested in sexualities scholarship, and so the organizers and presenters challenged us to consider more fully how the concepts of race and empire have been inadequately addressed by sexualities research. That is, how can the study of sexualities realize its intersectional potential in considering empire as both internal and external to the nation? How is it that people of color continue to be ignored by sexualities scholars despite the fact that so many of us are first told to look to the Civil Rights Movement for guidance in understanding the LGBTQ movement? As the most successful conferences do, this one elicited many more questions than answers and suggested a deeper interrogation of my own perspective in research. A morbid curiosity, a proclivity for the macabre. Something drew me to the Mütter Museum of the College of Physicians in Philadelphia. Billed as disturbingly informative™ (yes, they have indeed trademarked the phrase), the museum is filled with all manner of human remains, skulls, internal organs, jars full of preserved and mangled tissue, collected and displayed in the name of science. Or is it education? Commemoration perhaps? What is the purpose of this museum? This is the nagging question that followed me through the exhibits, a question only further exacerbated by the stated prohibition against photographs. Why should this be the rule? The sign suggests this is out of respect for those who are still living. 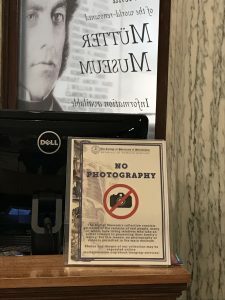 But the museum itself posts images on its website and for a meager buck twenty-five, you can purchase postcards that are photos of those very exhibits. And there is of course the simple fact that one can purchase a ticket to view, to gaze upon, to ogle the remains. One is left wondering what Michael Taussig might have to say about this. Is this rule rooted in the fear, the possibility, the power of defacement, of disrespect? Why is it that we, the transitory viewer, are prohibited from taking a photo but are permitted, with proper payment, to stand gawking among the remains for hours on end?